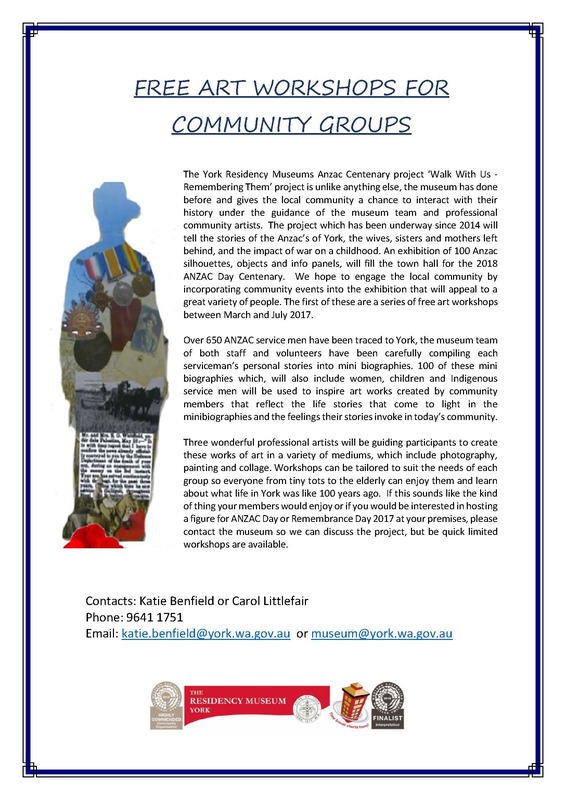 The York Residency Museums Anzac Centenary project ‘Walk With Us -Remembering Them’ project is unlike anything else, the museum has done before and gives the local community a chance to interact with their history under the guidance of the museum team and professional community artists. The project which has been underway since 2014 will tell the stories of the Anzac’s of York, the wives, sisters and mothers left behind, and the impact of war on a childhood. An exhibition of 100 Anzac silhouettes, objects and info panels, will fill the town hall for the 2018 ANZAC Day Centenary. We hope to engage the local community by incorporating community events into the exhibition that will appeal to a great variety of people. The first of these are a series of free art workshops between March and July 2017. Over 650 ANZAC service men have been traced to York, the museum team of both staff and volunteers have been carefully compiling each serviceman’s personal stories into mini biographies. 100 of these mini biographies which, will also include women, children and Indigenous service men will be used to inspire art works created by community members that reflect the life stories that come to light in the minibiographies and the feelings their stories invoke in today’s community. Three wonderful professional artists will be guiding participants to create these works of art in a variety of mediums, which include photography, painting and collage. Workshops can be tailored to suit the needs of each group so everyone from tiny tots to the elderly can enjoy them and learn about what life in York was like 100 years ago. If this sounds like the kind of thing your members would enjoy or if you would be interested in hosting a figure for ANZAC Day or Remembrance Day 2017 at your premises, please contact the museum so we can discuss the project, but be quick limited workshops are available.